A month ago, the children were invited to try a new creative provocation with acrylic paints, paper and their imagination. First, the invitation asked the children to carefully choose paper and to think about the various options of color, texture and weight. The children picked paper that would influence the look and feel of the work they were about to begin. There is no correct answer, but the ability to choose materials and achieve the result you desire is the work creative people perform all of the time. The work we were engaged in was not about the thing we were making, but about the creative journey and how it unfolds. The technique was simple. The children were invited to take their paper choice and crumple it up into a ball. Next, the children were invited to paint the paper any way they wanted using different colors of acrylic. There were about twenty different colors of paint to choose from. Why so many colors of paint? That seems like too many. There were so many colors because the acrylic we were using for this work was in sample sizes. Again, the focus was not on the thing we were making but the decisions creative folks have to make during the creative process. As an observer, I was wondering if the children would leave the paper in a ball or turn the paper into a different shape before beginning to paint? Are the children motivated by our simple instructions or their own creative desires? The children dove into the work. Everyone was excited to crumple the paper and begin creating. After only a few minutes, the children started to experiment with their own ideas for the work. Some children un-crumpled their paper and others twisted the paper creating a different effect. During this part of the process, the children were in conversation, talking about their ideas for the work and motivating each other to try new ways of manipulating the paper. This was an interesting time of exploration and observation. The children used these simple materials and quickly made the process their own. The group was working together sharing ideas and collaborating verbally, then employed the shared ideas to create their own original paper creation. Inspired by their paper creations the children began adding color to their work. The children were experimenting with their brushwork by mixing colors and testing methods for applying the paint to crumpled paper. The children were adding paint to their shape and watching it react. Some of the paper creations changed, as the moisture of the paint mixed with the dryness of the paper. Then some children flattened out their paper creation and others left their original crumpled creation to dry. The un-crumpled and crumpled paper created different three-dimensional blobs that transformed for a third time when they dried. The entire process of working with paper and paint included much experimentation. When I thought the children were finished with the work, is the exact moment when the children started manipulating the paper again. 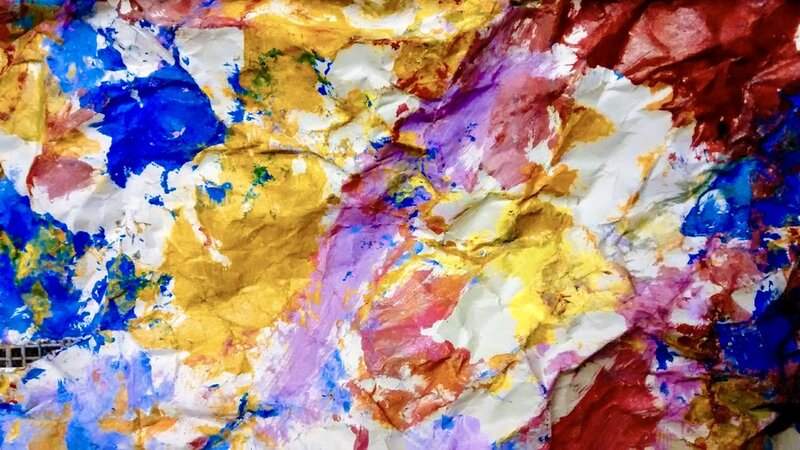 The children were not concerned with all of the paint that was covering their hands as they made the paper into the exact shape their creative spirit was asking them to create in the moment. The children were wrapped in the creative process, focused on what the paper will become, and taking journey with no end. This was just the beginning. As I mentioned in the beginning, the process was not about paper or paint. The provocation was inviting the children to use simple materials and go on a journey, a journey without a known destination. A journey that is different from the one they take on a daily basis in school. A journey with no rules or expectations, but the opportunity to learn more about their friends and themselves by exploring some paper and paint.